What if there is more to this world, to life, than our day-to-day tasks, challenges and issues? What if there is more to us? What if there is another realm beyond the veil of our human consciousness that is standing by, waiting to assist us in every single nuance of our human experience? If you knew that, would you open your mind to welcome, accept and allow the unseen and unexplainable—the More—to take over your life? and its sequel answer these questions. 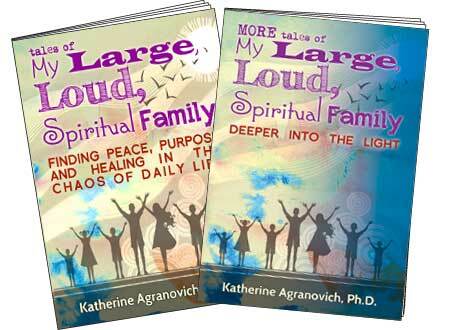 Join Dr. Katherine Agranovich in More Tales of My Large, Loud, Spiritual Family: Deeper into the Light as she recounts how she, husband Felix, and their five children continue to face both physical and non-physical trials and tribulations in the midst of everyday life. Each day takes the Agranovich family on a quirky spiritual adventure where “weird, crazy and abnormal” become the norm. In the first book, their young son is startled awake by a headless man, their daughter banishes obnoxious ghosts from her grandparents’ home and is whisked into the future to her wedding day. Even Katherine’s non-psychic husband, Felix, betrayed by his business partner, meets an astral financial advisor who offers sound advice in the midst of an economic crisis. But in order to embrace their children’s spirituality, Felix and Katherine, atheist Jewish refugees from Soviet Russia, have to undergo profound spiritual transformation themselves. Now, with the long-awaited sequel, both books offer hope, courage and inspiration to parents committed to raising their children as spiritual beings. My husband Felix makes a half-circle around me, and sits on the bed. “The weirdest thing has happened to me,” he says, looking so pale that I think maybe I should go to the liquor store myself and get the poor man a hotdog and nachos. “After a papaya-and-something bran shake,” he begins, wincing and releasing a burp, “I dozed off on the café’s patio. “He pauses, looking at me as if seeing me for the first time. “Maybe I’ve been around you for too long, but… I had a vision,” he utters the words as if they're Chinese. Beginning to feel weird myself, I pull a chair up to the bed, anxious to hear his papaya-induced vision. The stories in these books will mystify you, enchant you, and change your view on family dynamics forever.